Winter is upon us, and while we may not be out in the snow we will be going out where possible through out the winter months. Fresh air and exercise are important to your child and we know you want to keep them warm and cozy when they are outside. Our uniform is practical and comfortable and when complete (with the normal winter additions) all our students will be toasty and happy. 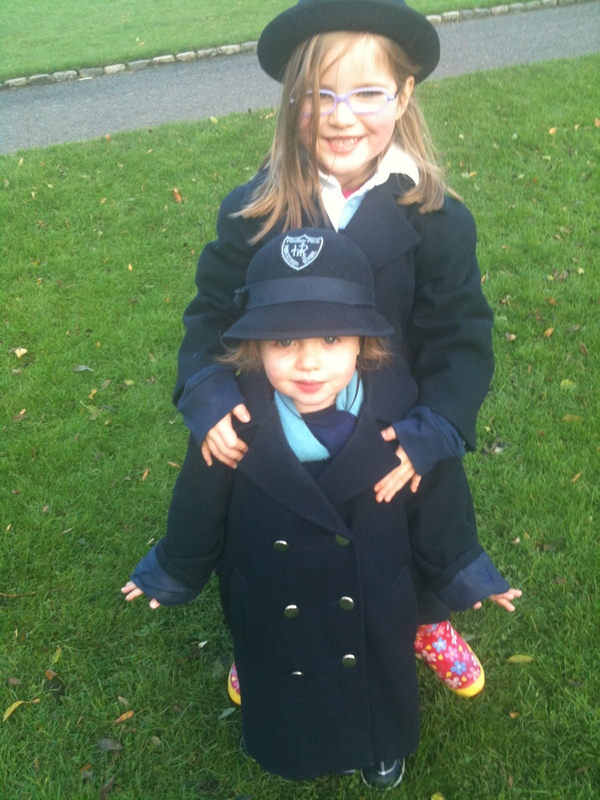 The School Overcoat, Hat & Scarf are a great place to begin, and for most that’s definitely warm enough. Wellington boots, for those muddy puddles and a second pair of warm socks will keep Jack Frost from those toes. Gloves and if needed a navy beanie hat to be worn under the school hat should keep ears extra cozy. Parents who have been with us last year are probably already aware of our class mailboxes. 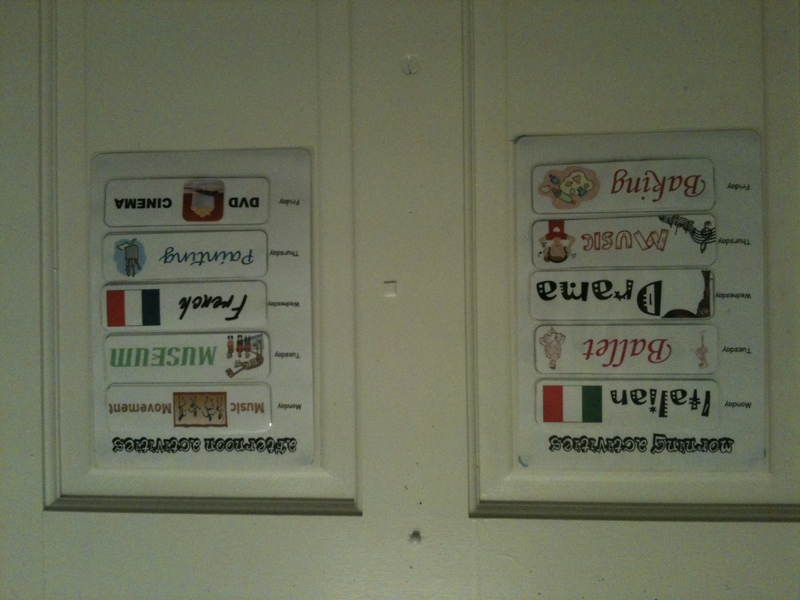 Each class group have mailboxes on the door, there is one for each child. Please continue to check these daily as your child may not notice mail waiting to go home. 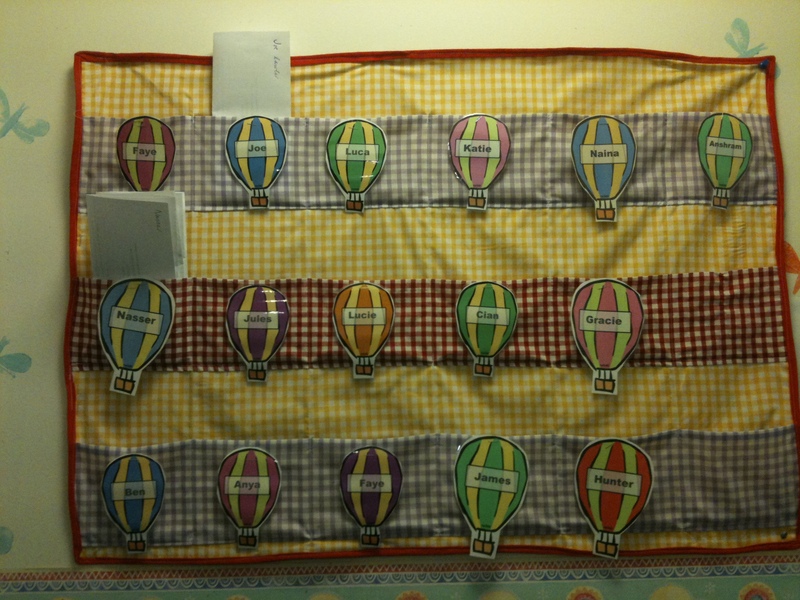 These are also useful if you wish to leave a note for another parent to arrange playdates and the like. Thursday is the day that children are chosen to bring a DVD to school, this is communicated via the mailbox too. Another great addition to our school day are the Morning and Afternoon Activity displays that are in the lobby area of each campus. Designed by our own Katie, these activity timetables let you know what your child has done and what is happening tomorrow so you can be ready. The nursery school also communicate via large signs on our front door, if we are out and about we also have teachers phone numbers so you can join up with us if you are collecting your child. 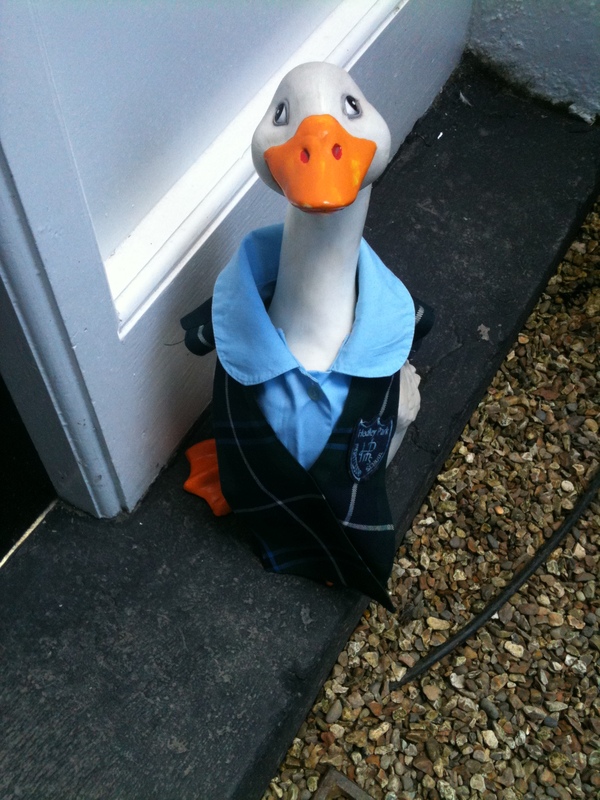 Final School News: Daisy Duck is going on a holiday to the Nursery! 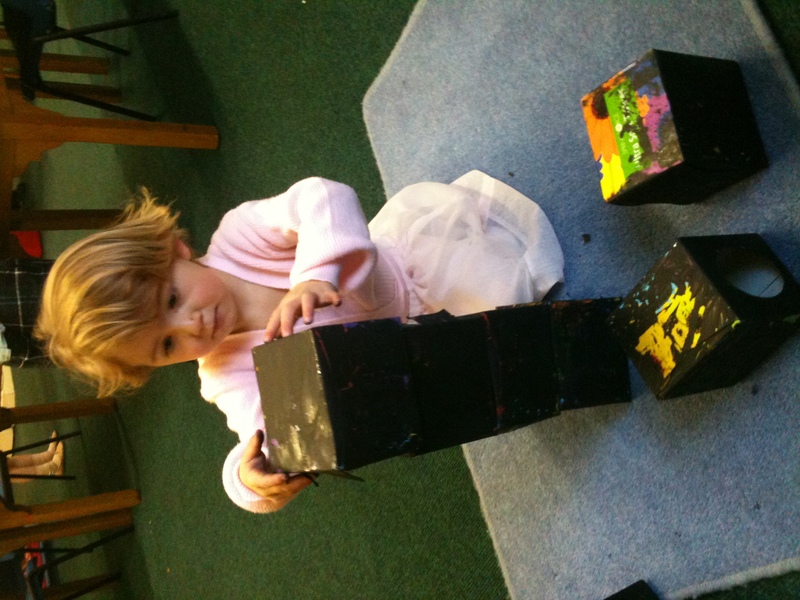 We’d like to leave you with a smile, parents may have seen or heard of their child working with the pink tower. We spoke about it in an earlier post. Well once a child has mastered this work don’t be surprised to see them try to build any set of cubes into a tower. 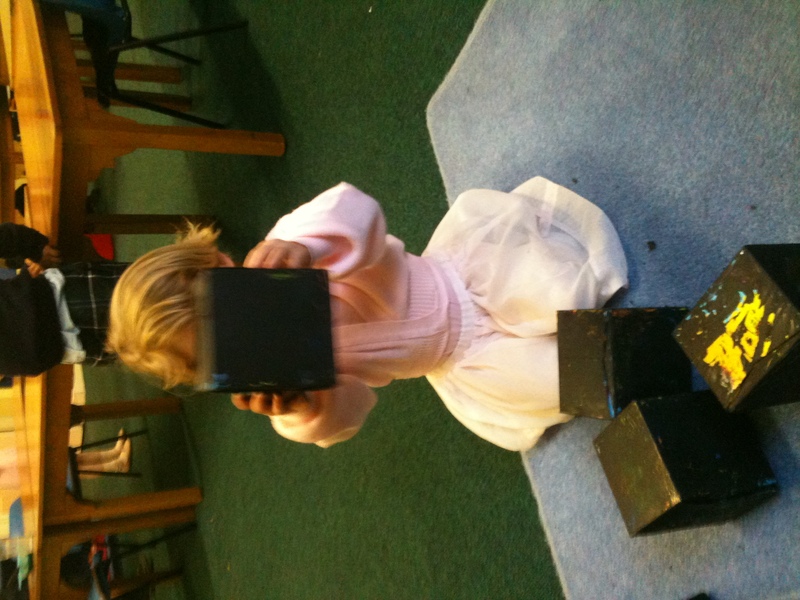 Early one morning, already dressed in her ballet gear one of our nursery children was looking at a set of tissue boxes painted black for an art project. The concentration and determination on her face as she was absorbed in her work. The teachers present for Breakfast club watched her work and had to capture the moment to share. Stay tuned for more general school news, especially as we are getting ready for the big anniversary school production of Peter Pan. With the countdown to the holiday season kicking off we wanted to share some of our fall term work with you. Our big school senior class children have been busy bees and are proud as anything to show you their handicraft and nature work. In celebration of National Birch Day some of the senior class participated in a photo shoot to highlight the event. They loved seeing the photographer in action, learning about composition and lighting and of course, admiring the end result; beautiful photos! One of the shots was even used in the free daily MetroHerald. 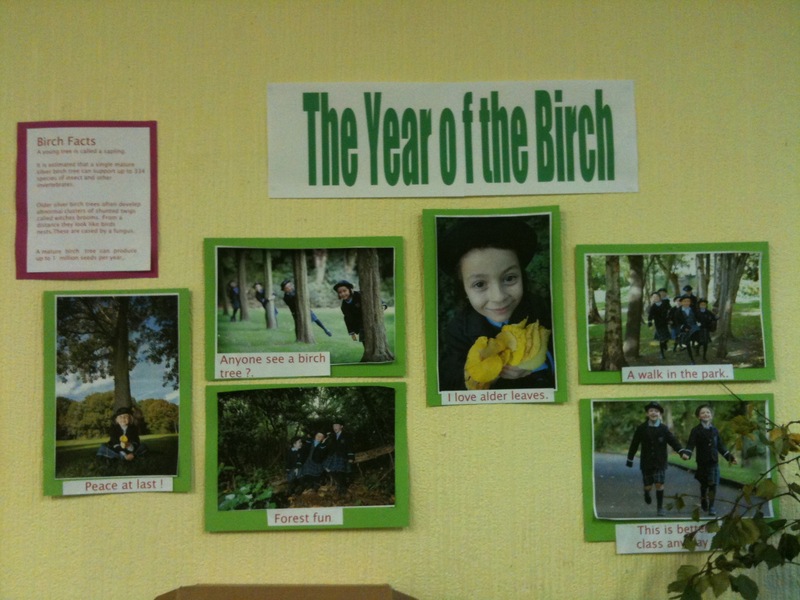 Dont worry if you missed your copy, you can download it here: Birchday (08-10-10). 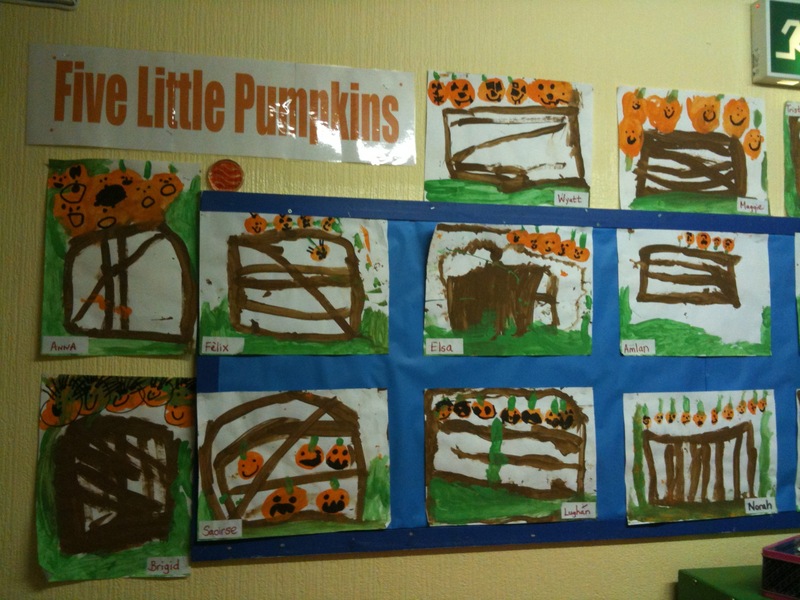 Many of the shots are proudly displayed in their class to commemorate the fun morning and all they discovered. 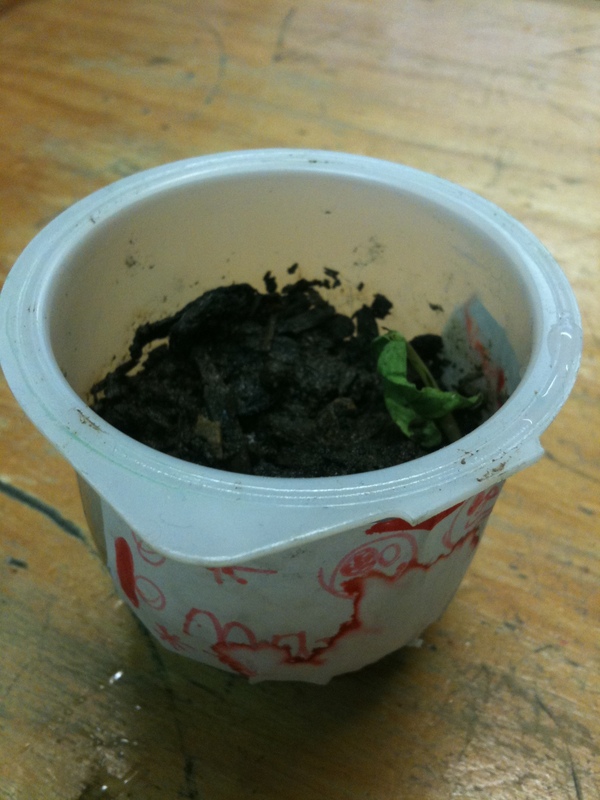 Resulting from this outing the students decided to plant their own birch seeds, and with regular watering they are growing nicely. We’ve even seen the first sprouting from Marcella’s birch seed. With a little more love they will be ready to go home in the spring and grow tall in our families gardens. Sunny morning in the park. 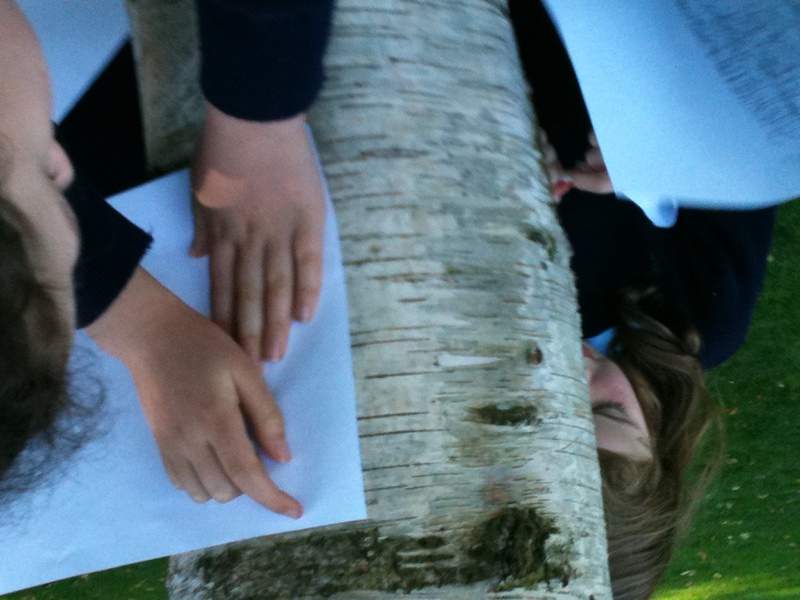 On another nature walk the students created some birch bark rubbings, investigating the patterns and contrasts in shading. 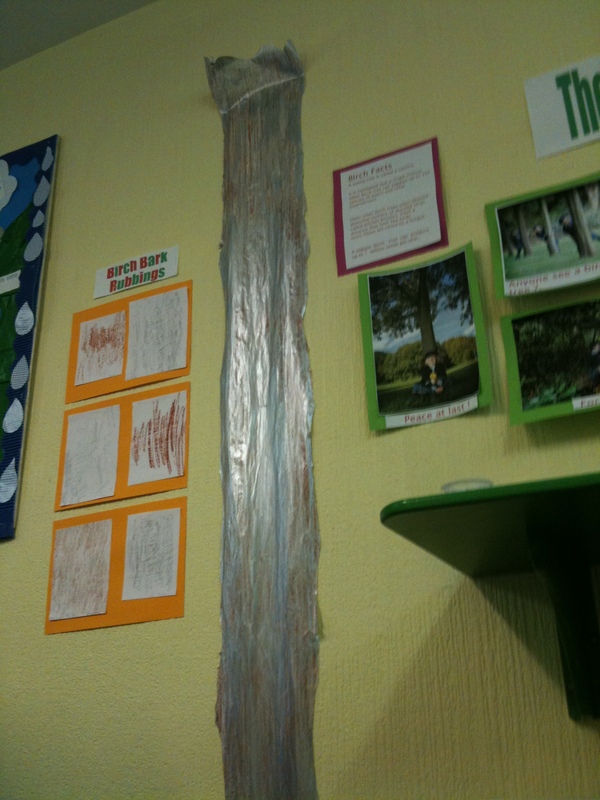 This inspired them to make a very impressive full-scale birch bark trunk. Using crayons and silver paint. We are sure you will agree it is very handsome. 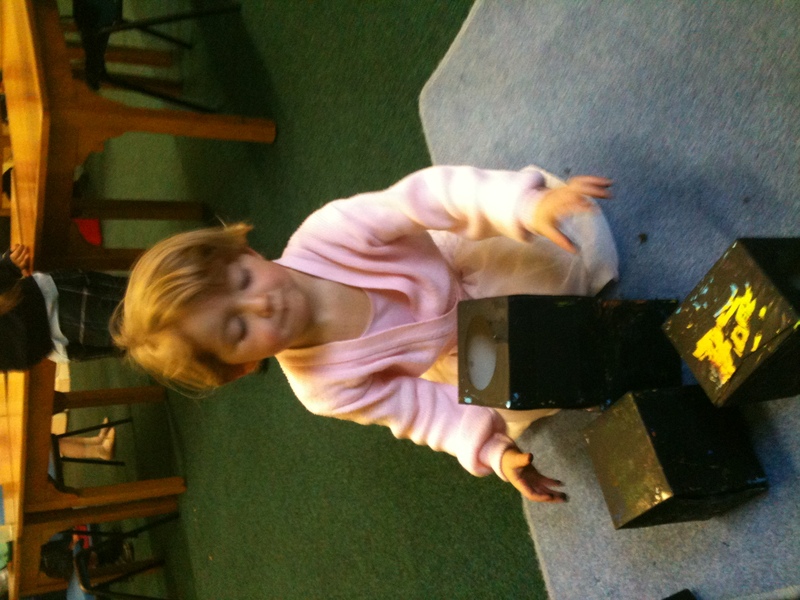 The core aspect of a Montessori community being that the activities of the community are child led. A Montessori teacher observes the talents and interests of the students, then provides inspiration, materials and projects for the children to explore and learn. 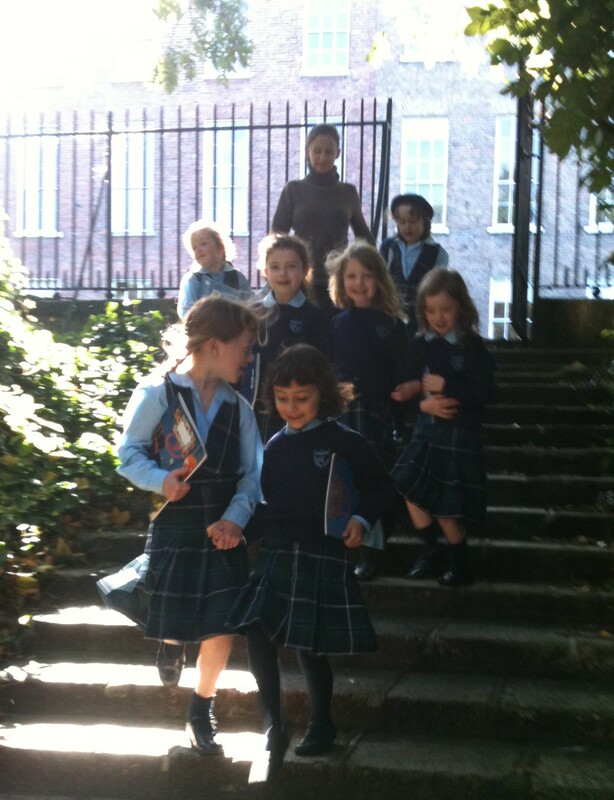 In Hedley Park we are in a unique position have been with the majority of our students from the age of two. 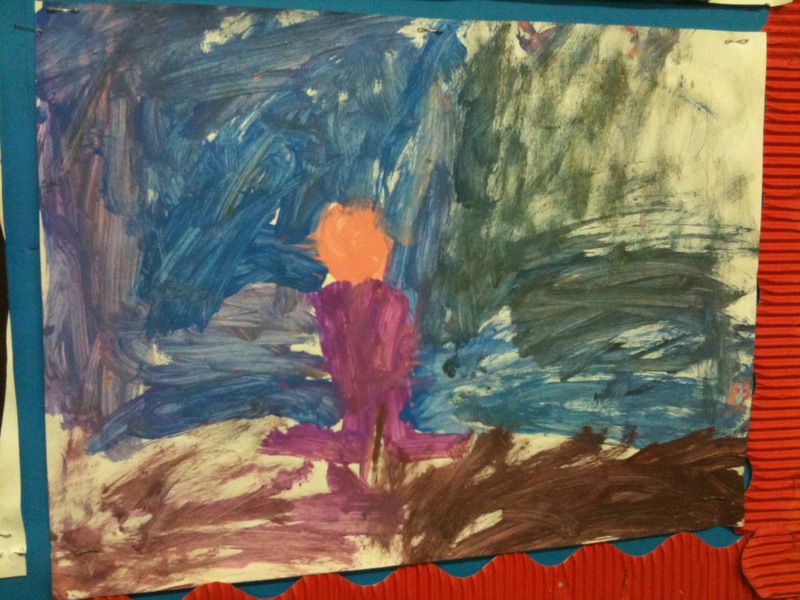 This gives us a deep understanding of each child in our care. 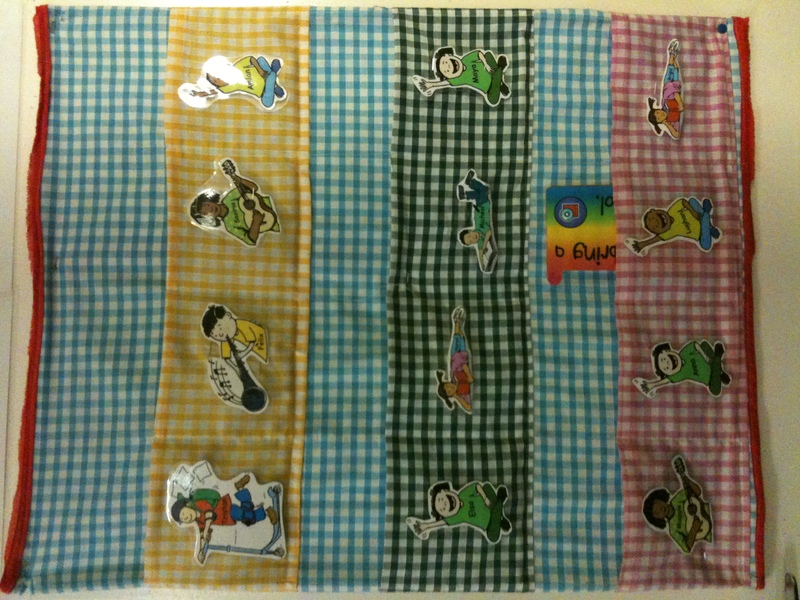 As a community led by the children’s interests the composition of the class members can really change the direction of the work. 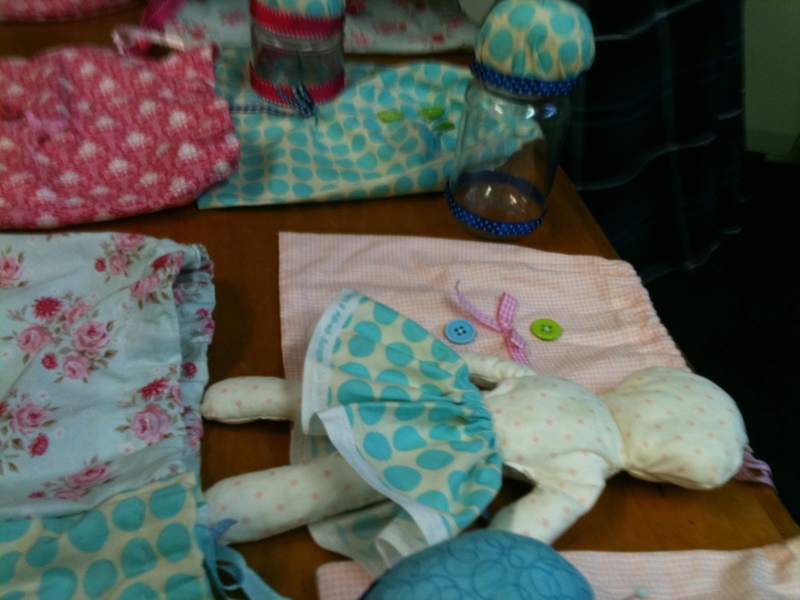 It became clear from the all female composition of this years class that some more traditionally gender specific projects would be well received and so the girls began a needlecraft project. 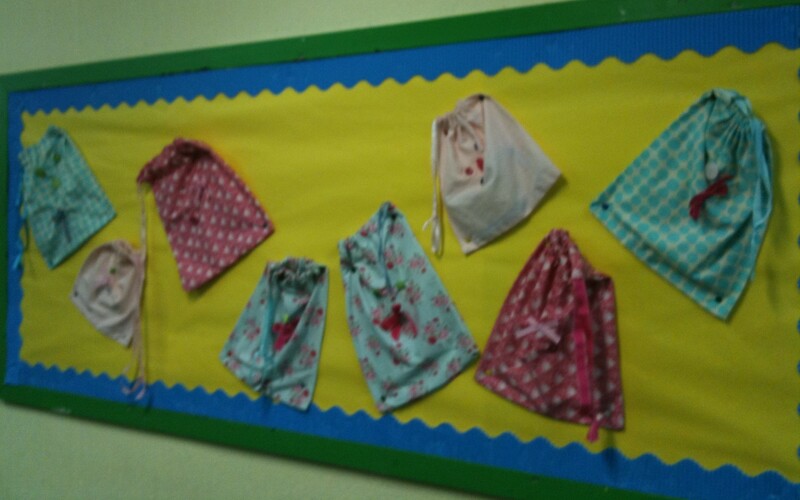 Sewing drawstring satchels, with a variety of stitching patterns and buttons to personalise their own work. 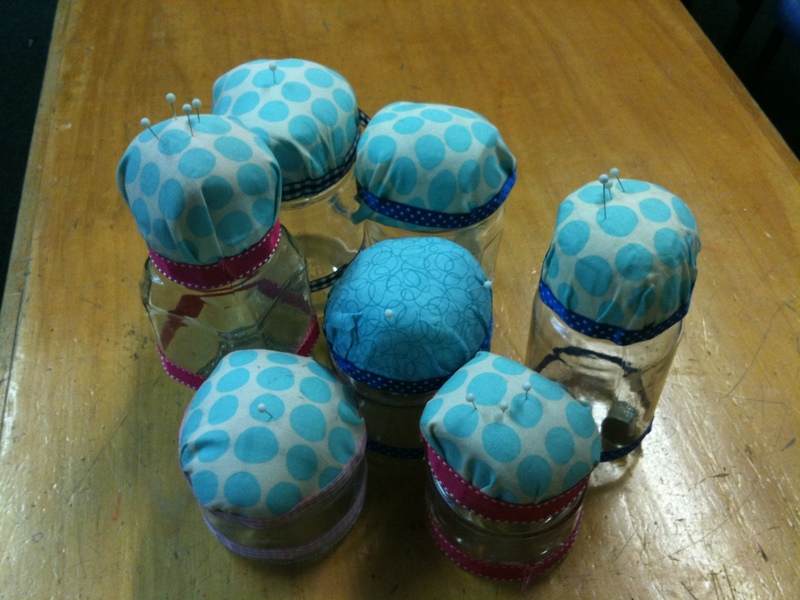 The students also created needlework jars and have begun working on dolls. Needlework is proving to be very popular, combining the talents of the colour and fashion sensitive students with the more technical design and mathematical minded. The staff and students of the Big School! Not to be outshone in any way by their older schoolmates, and in many cases older siblings. 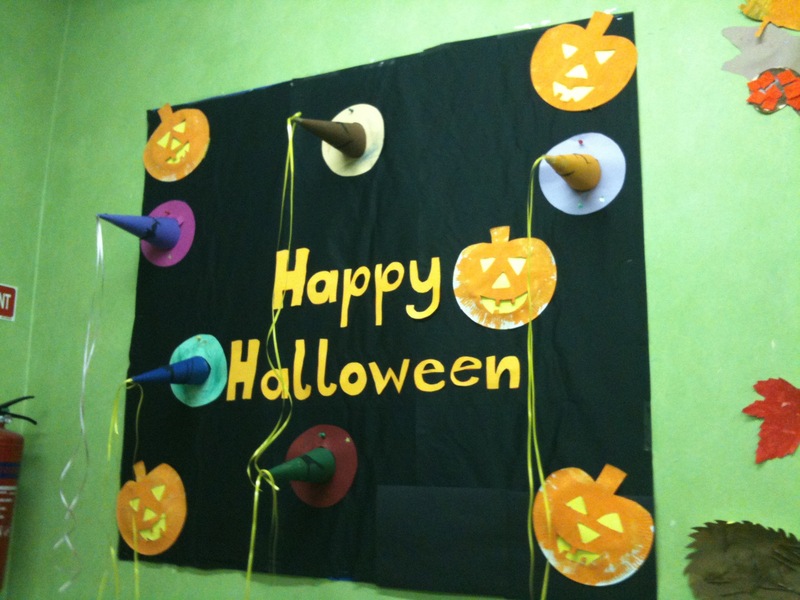 The preschool students got into the Halloween mood early thanks to some great junior class wall art. 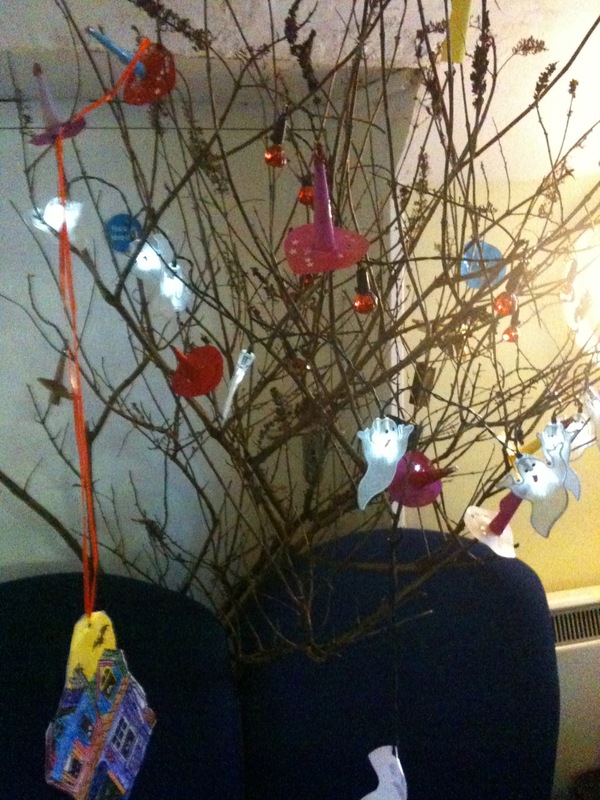 They charmed us all with their poem, Flutter Flutter Little Bat…. and created an arch way of painted bats under which they practiced. 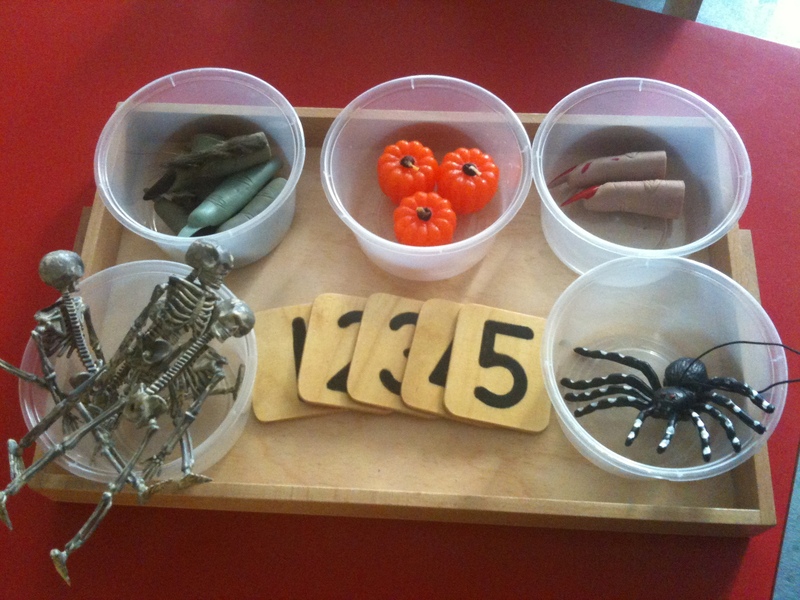 In the senior class they also used the Halloween theme in some freakishly fun counting game. How many Skeletons can you count? 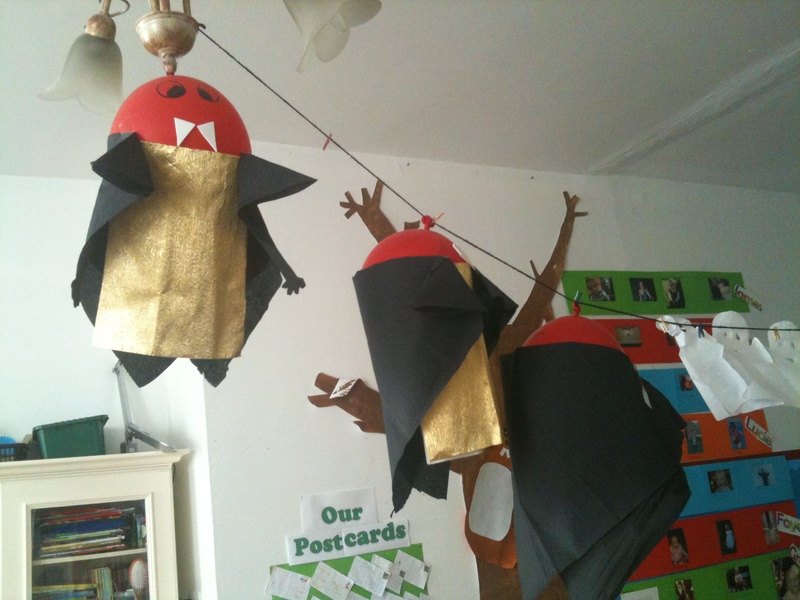 Another popular activity was our balloon vampires and ghosts…. 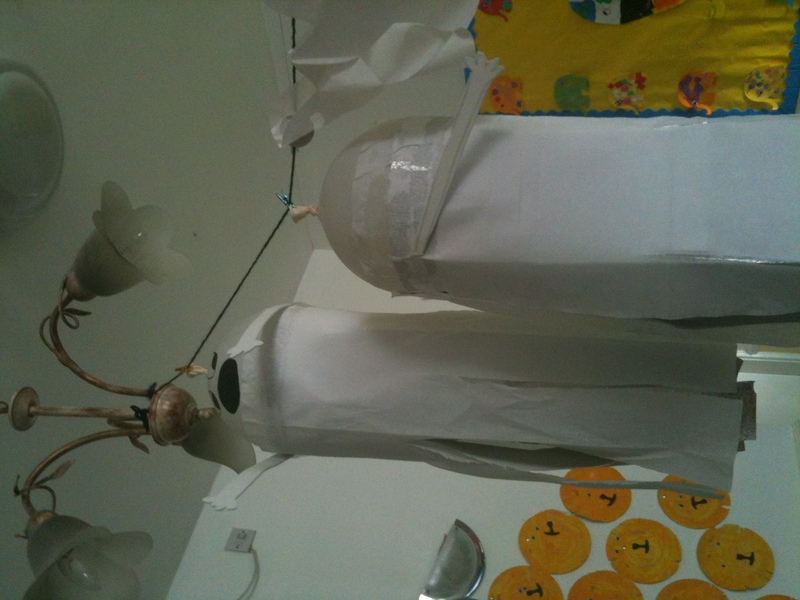 Ghosts Floating in the classroom! 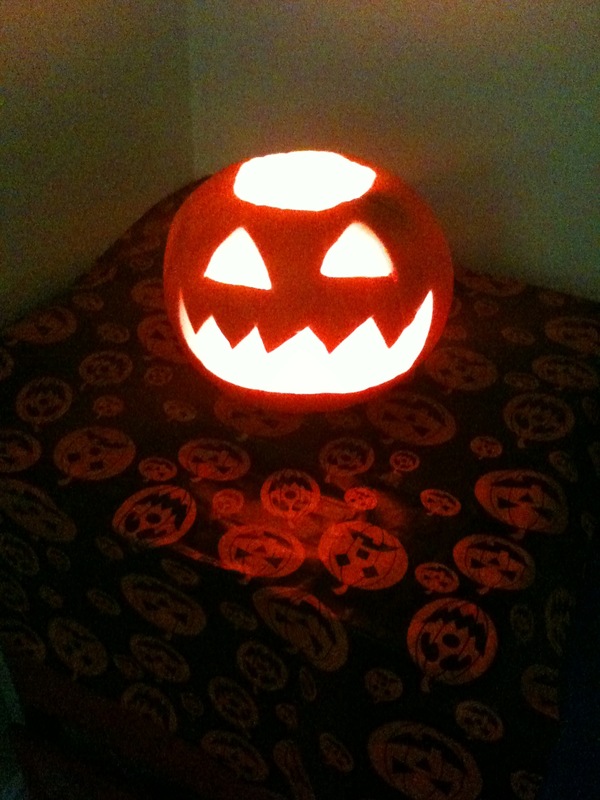 By far the most exciting craft was our pumpkin carving afternoon! The rainy autumn evening was made more cheerful by the delighted and satisfied faces as they ate their afternoon snack in its glow. 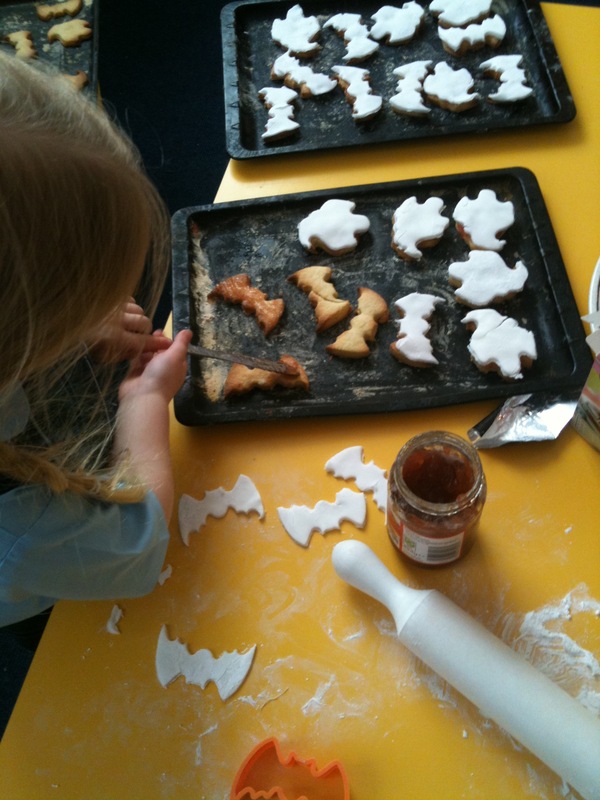 Knowing they carved his scary face and scraped his insides clean made our little charges only too pleased to show their handiwork to the proud mummies and daddies that evening! Turn the lights off, he's COOOOL!!! 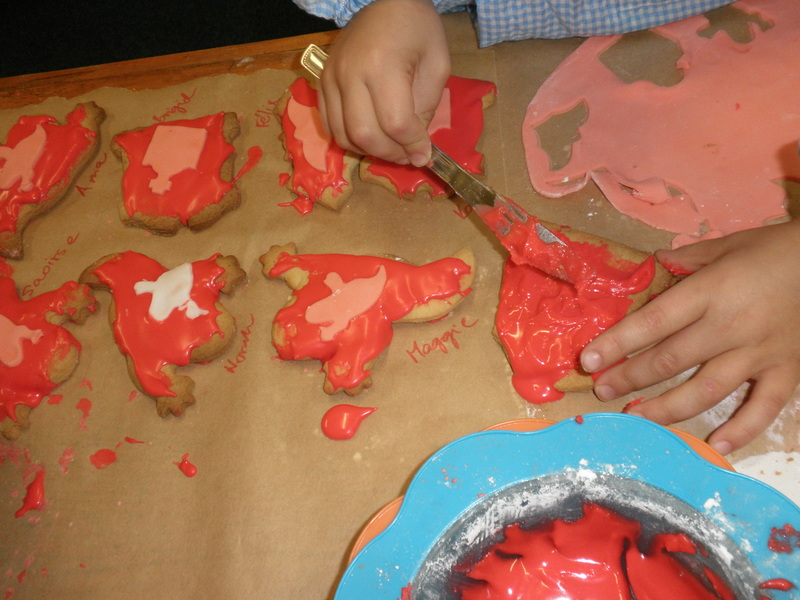 Spreading the jam on the cookie! and the outcome? …. yum yum! The only words are.... Om-Nom-Nom!! 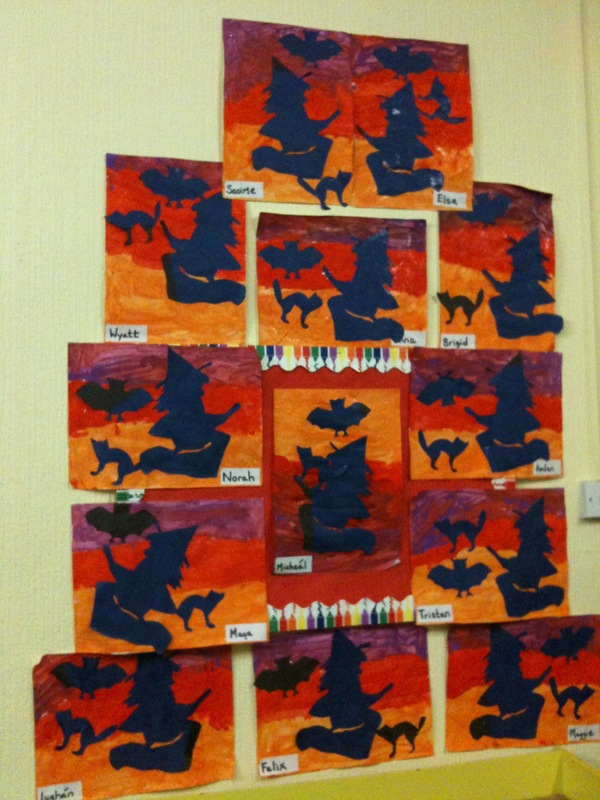 So now you know all about our Witches Walk, but that was really just the climax of weeks of Halloween themed work in many of our class groups. 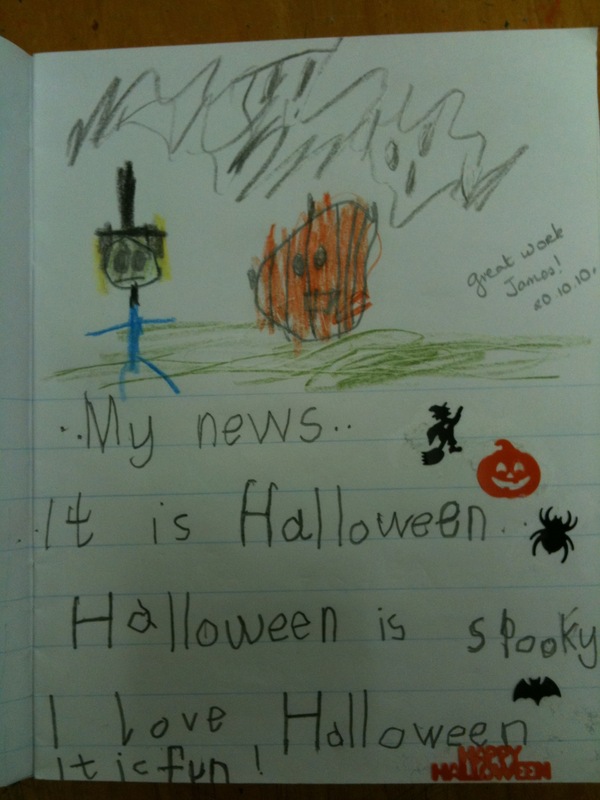 In the big school, Junior Infants had lots of spooky work taking place. Montessori practical life staples of spooning, sieving and pouring took on a new dimension with the addition of spiders and witches fingers, and other creepy cuties in the sand, water and rice. Lots of treasures to be found kept the students returning to the shelves for the work. 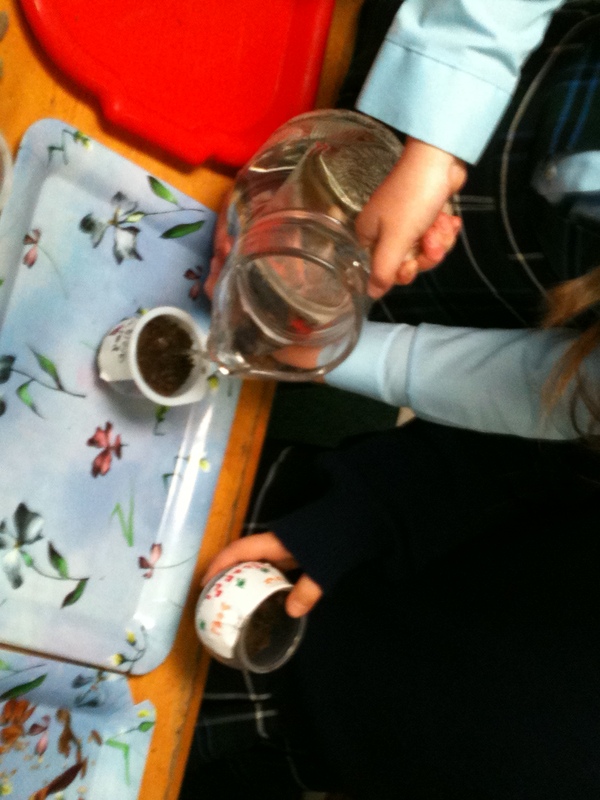 You may ask why we have shelf work like spooning and sieving and pouring in a junior infants class. This work promotes hand-eye coordination, concentration, fine motor skills and the all important pincer grip for correct pencil holding. This strengthens hands for writing, eyes for reading and minds for further work. Changing this work often keeps the students interest and so further expands their developments in these key areas. Four Cats or Four Pumpkins? 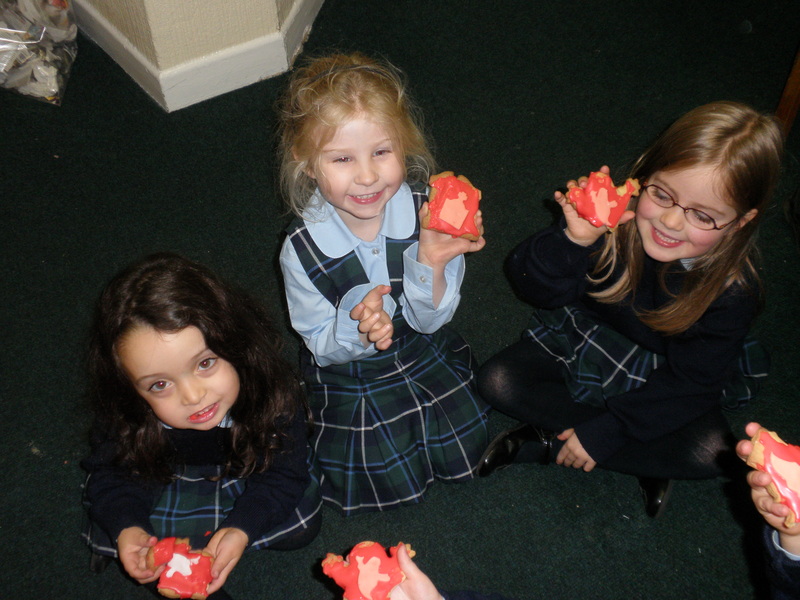 Another addition to the class activities was Cackling Counting! 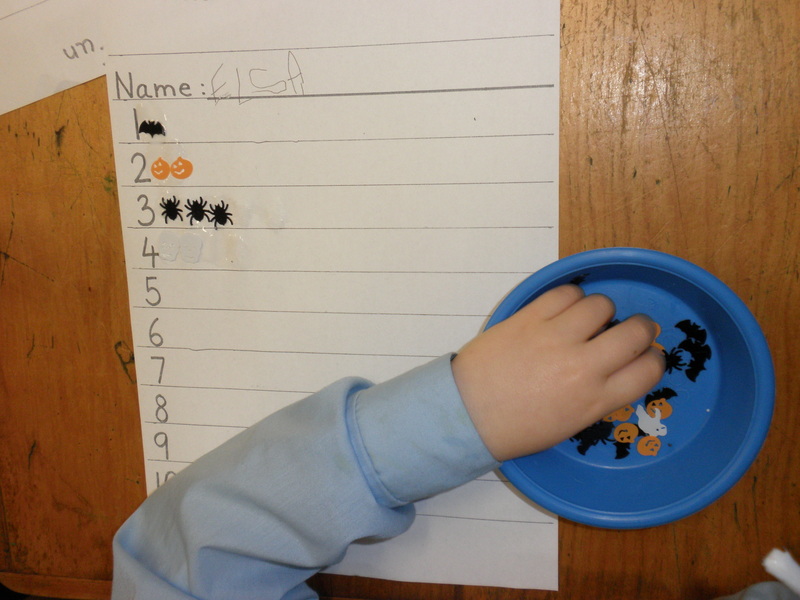 Number recognition, counting, pattern building, gluing and lots of fine motor skills combine to make a really fun individual learning activity. Where shall I pin the pelvis? 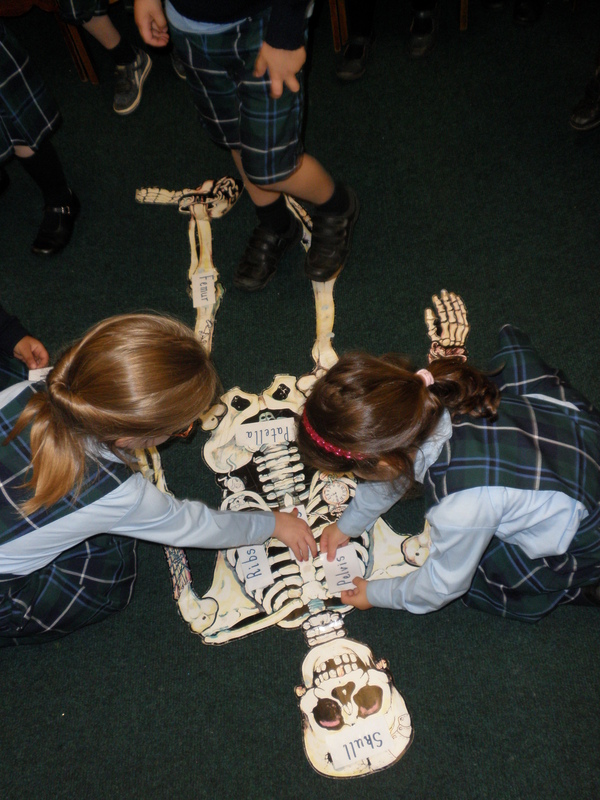 Of course not everything is best learnt on your own, and Junior Infants work very well together on the Pin the Bone on the Skeleton. 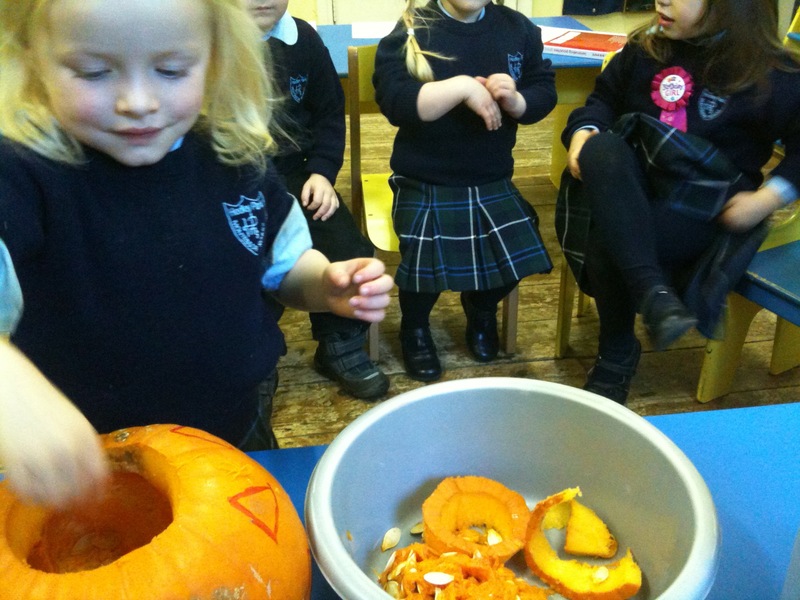 Senior Infants were bubbling up some devilish delights of their own. 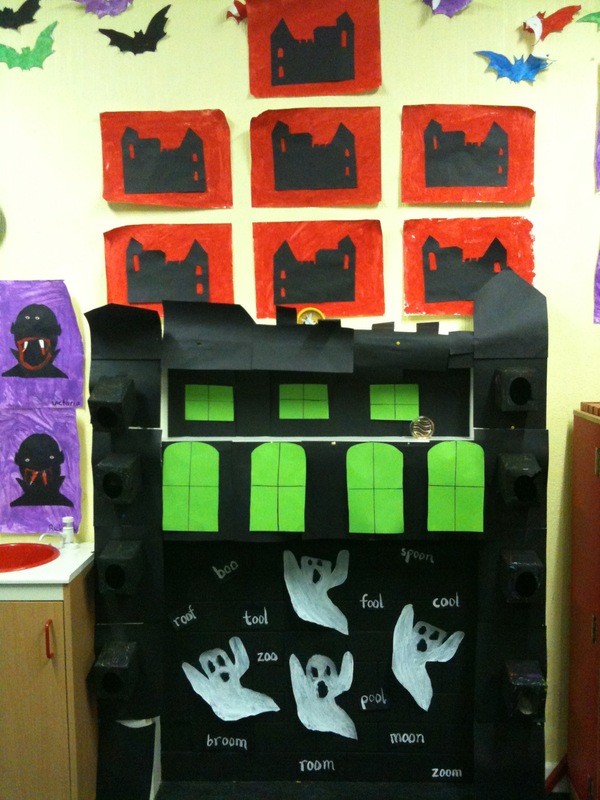 Again the marriage of the two curricula with a pinch of Hedley Park Magic, saw the children using thier phonogram work to put the Boo, Zoom, Broom and Spook into their “oo” phonogram. 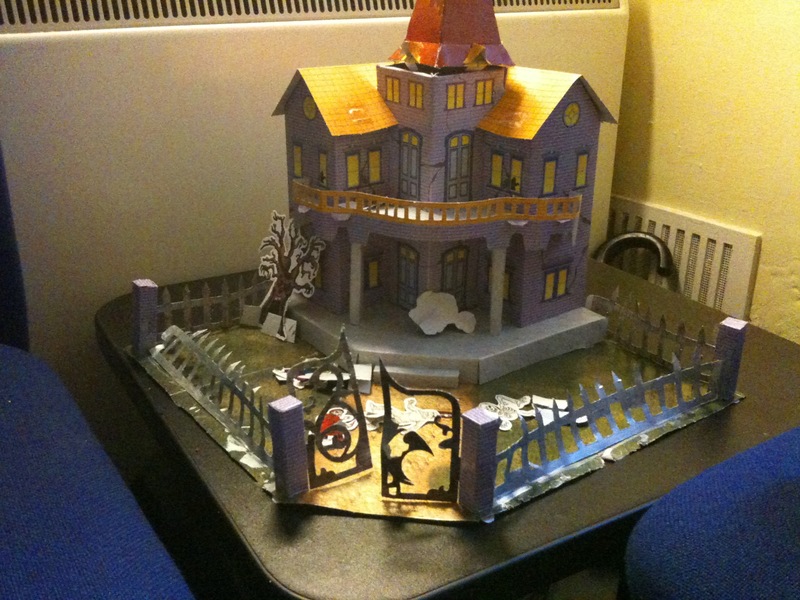 They built a Dracula’s Castle, haunted by ghosts and many many vampire bats. 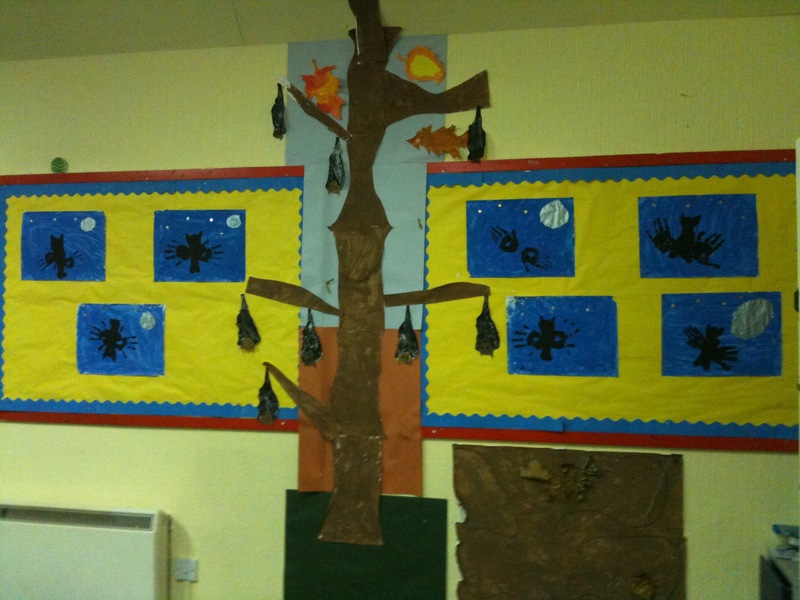 This tied nicely into the end of their autumn hibernation theme with the study of bats. 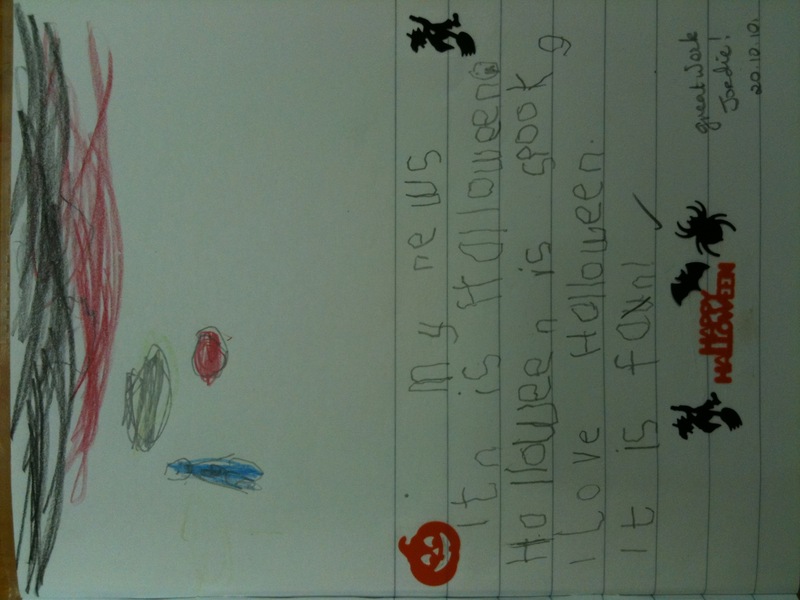 Rounding up Senior Infants Halloween Work display, some frighteningly good handwriting! 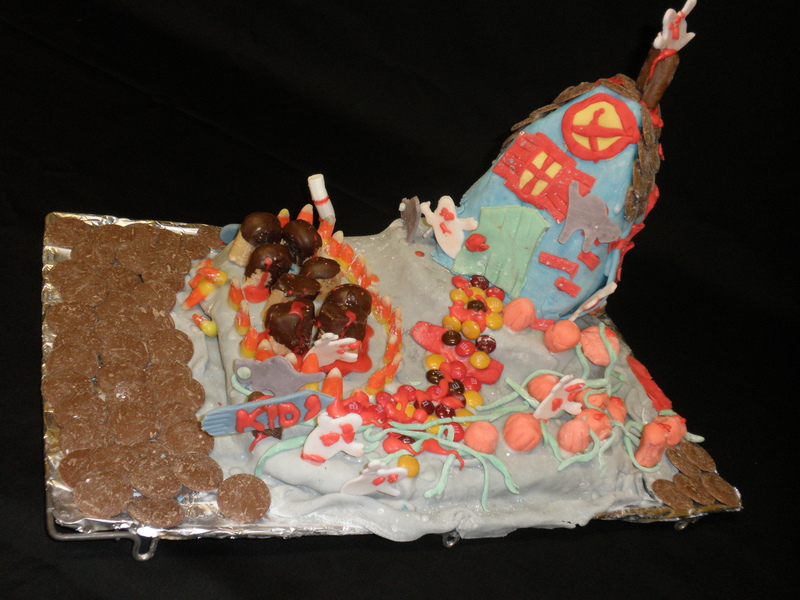 Finally, the entire big school got involved in some pretty spectacular crafting and baking! 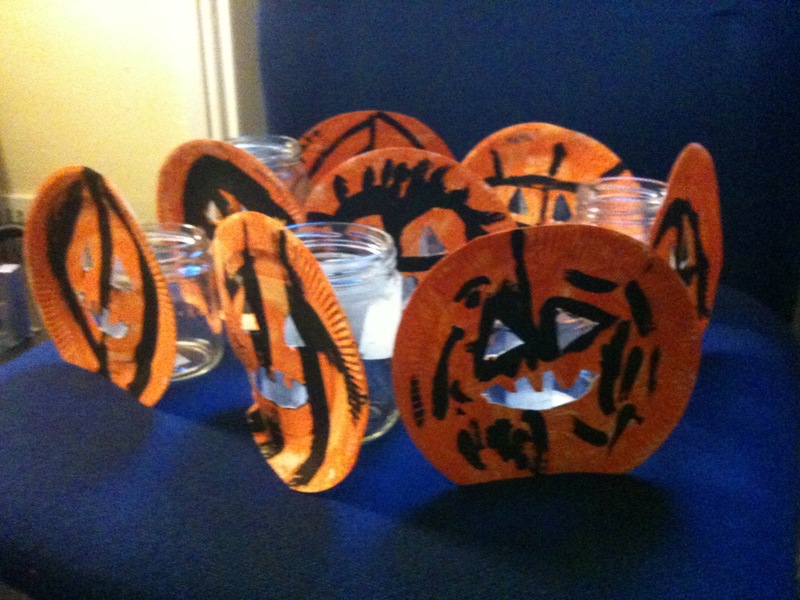 The reception area planting took on a scary air with miniature witches hats, ghost lanterns and pumpkin lights! I think you’ll agree the Junior and Senior Infants, with help from the rest of their big school friends are a talented bunch! 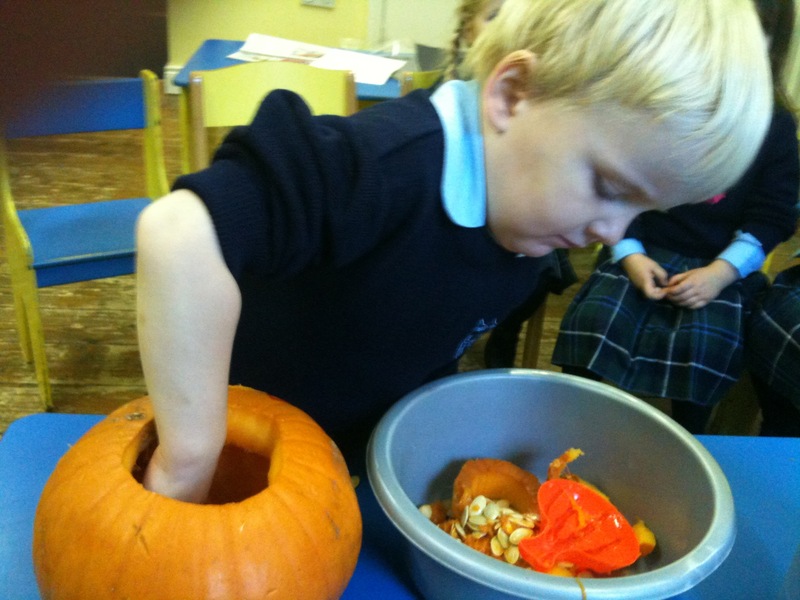 We hope you are all suitably refreshed from the midterm break holidays and ready for a great second half of our autumn term, but before we get stuck in we’d like to share our most special of Halloween activities with you. 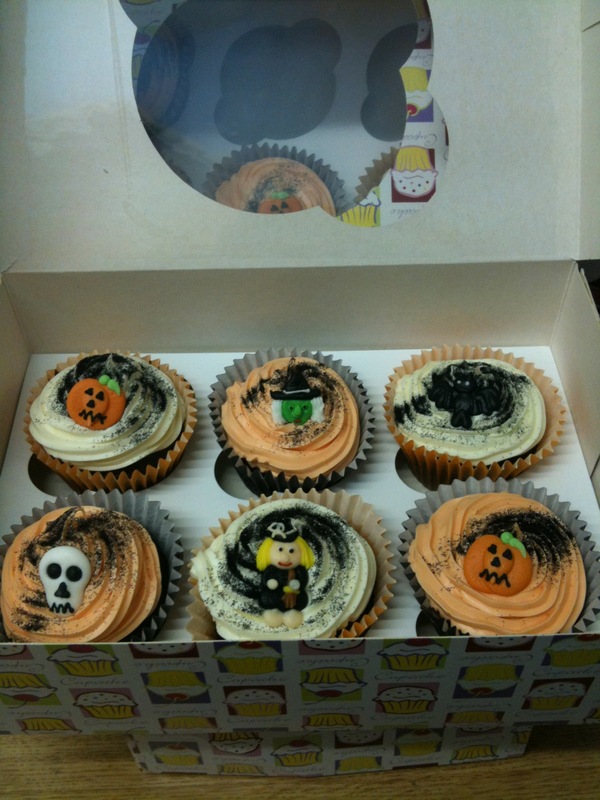 At Hedley Park we like to take the students favourite celebrations and make them really special, and Halloween is one of the more spectacular in the calendar. 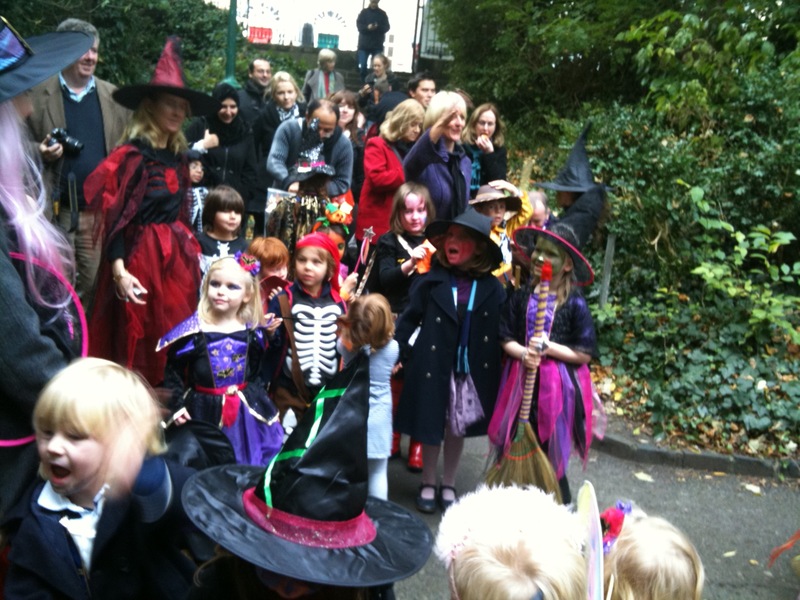 With 2010 being our 20th Anniversary Year, the students and parents were hoping our annual Witches Walk would be just that little bit more dramatic and spooky and they were not disappointed. Listening to a wickedly good story! 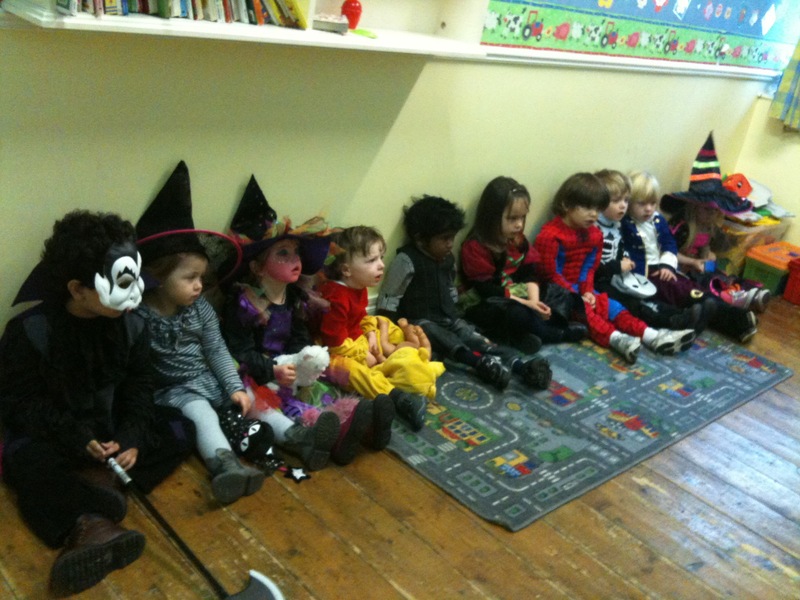 From early morning our little mummies, monsters, witches and warlocks, pirates, princesses and an action hero or two came to “ghoul” for their midterm party! Faces were painted, as songs and stories, popcorn and warlocks brew kept the trick or treaters happily guessing what magic awaited them on the Witches Walk! Up in the “big school” all was not as it should have been, it seemed that the spells cast by our apprentice witches during the week worked, and we all gasped as we discovered a Warty Witch had kidnapped our beloved teacher Katie… to help release her (and get our treats) we had to race to the park and collect the ingredients for her most peculiar of potions! 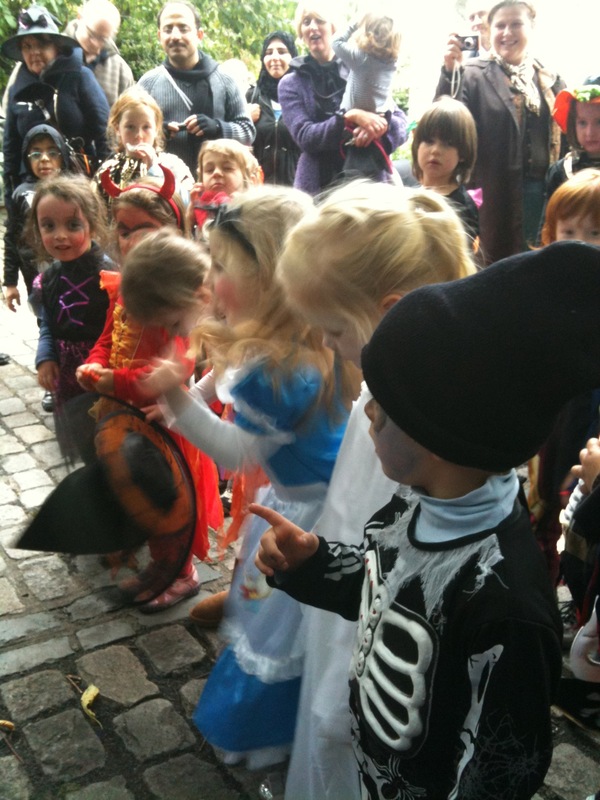 Our Witchy Families head to the park. Off we scurried and hurried to the far corners of the park (thankful we had our parents to help us on our way) in search of the witches horrendous haul. We found on our journeys amongst other things, bat wings, and slugs, buzzard’s innards, snake skins and bugs. 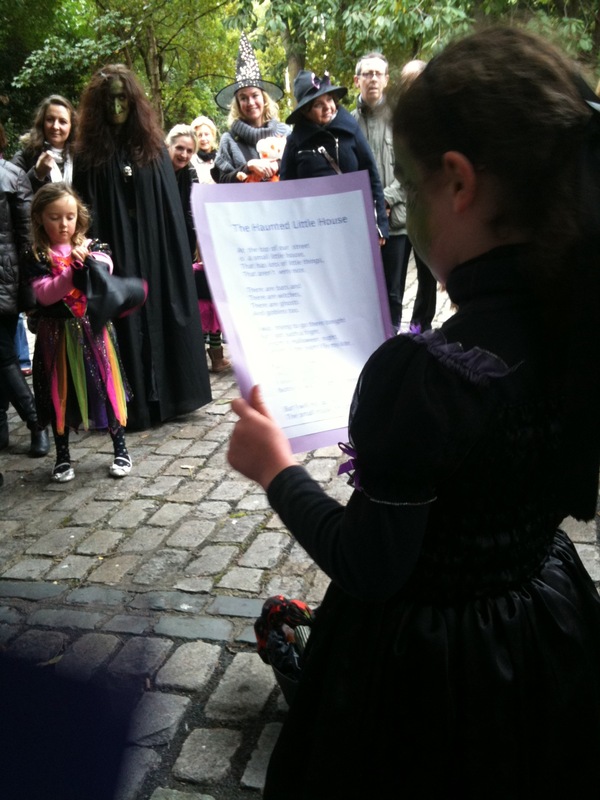 At each new discovery we sang our halloween songs and recited rhymes, some of us had even penned a poem or two for just the occasion. 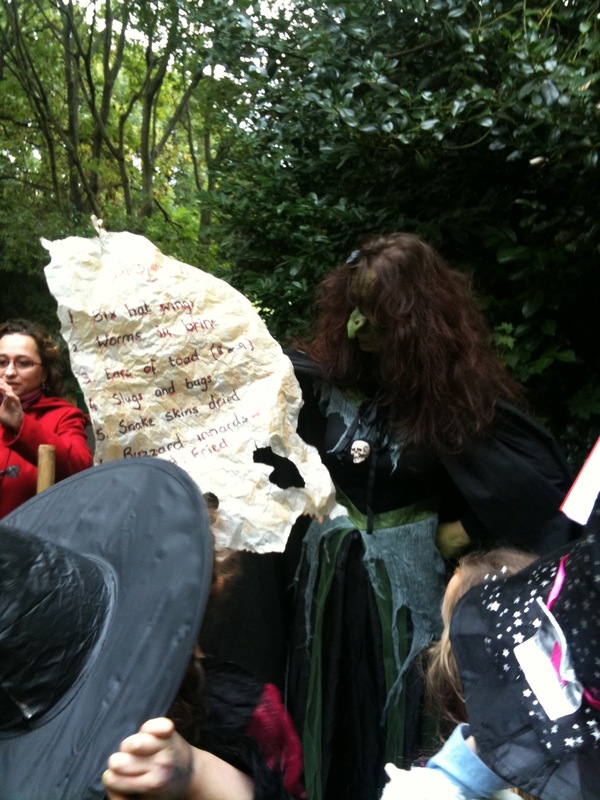 Bewitching the Witch with our words. 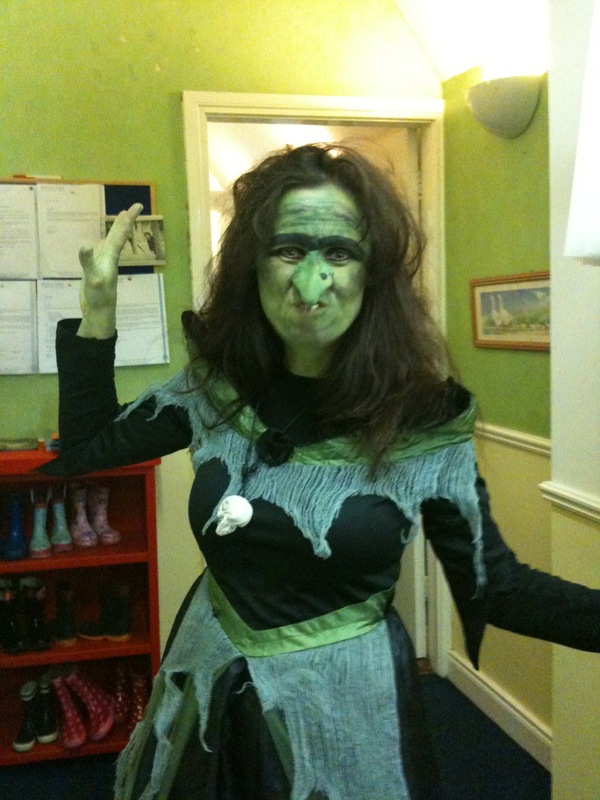 All of this kept our Warty Witch cackling with delight and we just knew one way or another that we’d get our Katie back! Finally we gathered at the Warty Witches cauldron fire. We then had to ask her very nicely using all of our manners if we could please have Katie back. We turned our backs for the magic spell and……. WHOOSH! 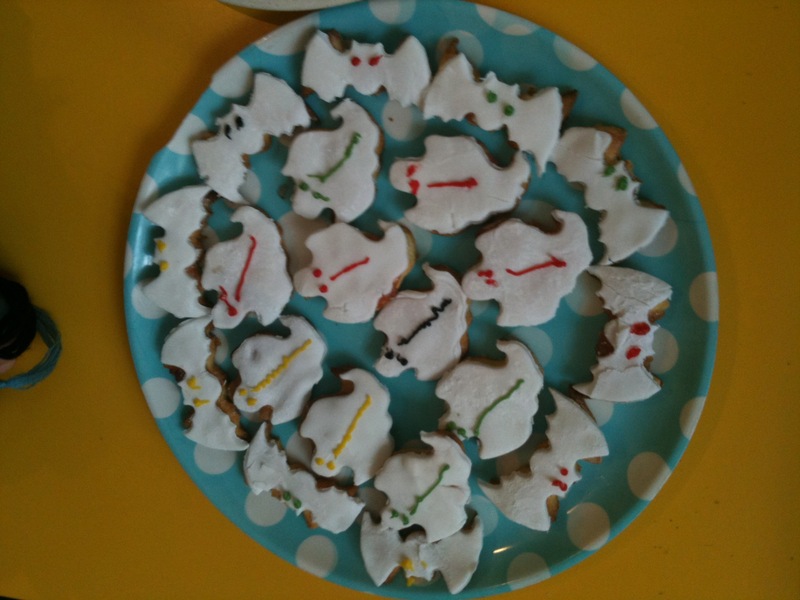 We got our wish, Katie was back at school and we had yummy treats for our hard work!